Despite good hi-res performance it still isn't far enough ahead of the outgoing 9800GX2. Another month another new graphics card from NVIDIA and yet another new naming convention to wrap your frontal lobes around. This time it's different...well different compared to everything that's happened in the year and a half since the mighty 8800GTX was first released onto an unsuspecting public that is. You see that was the last time NVIDIA released a serious high-end GPU. In between we've had the slightly up-clocked 8800 Ultra and a whole host of sometimes worthy, sometimes irrelevant revisions to confuse and bloat the marketplace. Can all that be forgiven though with the release of the high-end GT200-powered cards? Sure, we've had the twin GPU 9800GX2, a card making claims to being the fastest card around, but that's been rapidly put out to pasture with these latest releases. What of the 9800GTX though? Again, a card that gave little more than the 8800GTX more than a year previous, making it one of those irrelevances we were talking about. In fact, the excellent 8800GT apart, we could have quite happily done without nearly every GeForce release since the Ultra. With all these big and beautiful numbers we should be hitting never before seen heights of graphical glory, right? You can guess where I'm going with that lead in can't you... At the standard desktop resolutions of 1680x1050 and 1920x1200 there really isn't a noticeable difference between the new 200-series cards and the 9800GX2. In fact with the level playing field of no anti-aliasing in our Crysis test, the GX2 managed to pull away slightly from both the new cards. Admittedly we're talking about single-GPU cards performing as well as the top multi-GPU card, but still it's not the jaw-dropping revolution we were promised. By releasing the 9800GX2 NVIDIA has stolen its own thunder. The extra £100-odd you're throwing down for the GTX280 doesn't really garner the extra performance you might rightfully expect from such graphical and financial extravagance. Where this new card does stand out though is at the ultra high-end resolution of the 30" monitor brigade. We were disappointed with the performance of the GX2 at 2560x1600; after all we were expecting all that bandwidth and GPU grunt to shunt around pixels on a 30" display with gay abandon. 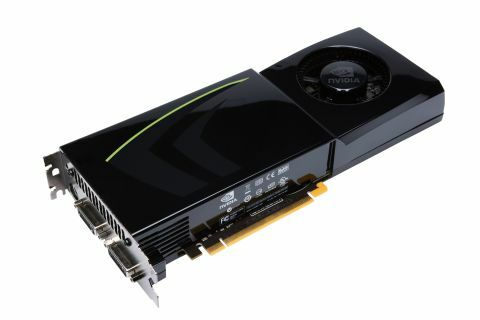 The extra memory and boosted memory interface though allow the GTX280 in particular to shine at fat-panel resolution. In both World in Conflict and Crysis it managed to double the performance of the GX2. There's also the small matter of the new card coming out of the red corner of the graphics market. The ATI Radeon 4850 is less than half the price of the GTX260 and doesn't lag that far behind in terms of gaming benches. The higher-clocked 4870 with the latest GDDR5 memory on board should also give the 260 a run for its money – for a fraction of the price. Still, the GTX280 finally delivers on the promise of high resolution DX10 gaming, even if it still refuses to support DX10.1. It is an excellent card, but we can't help but feel it's a little over priced.